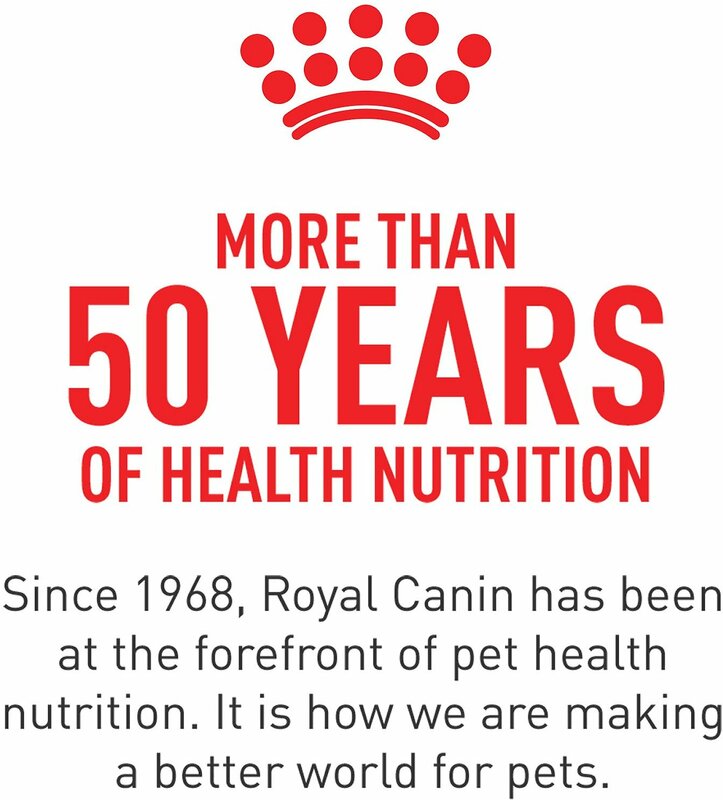 Royal Canin Veterinary Diet Selected Protein Adult PW Dry Dog Food is a highly palatable diet for dogs with food sensitivities. 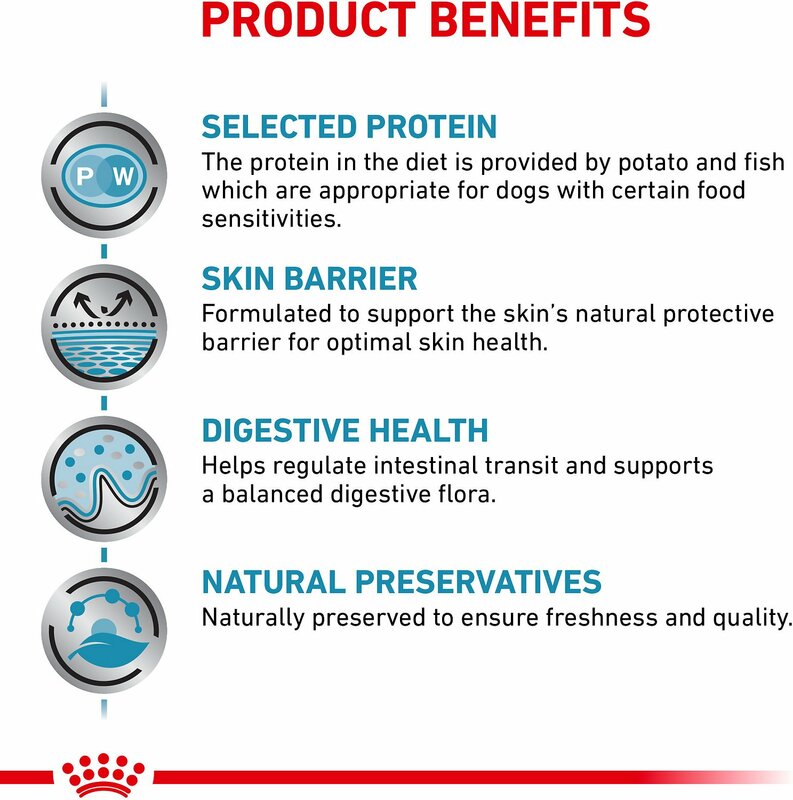 This limited ingredient diet is formulated with a novel protein, whitefish, as well as potatoes to help dogs that cannot digest common proteins. It contains omega-3 fatty acids EPA and DHA help promote healthy skin and coat. This diet also has essential nutrients to support dogs with skin sensitivities and irritation to maintain a normal life. 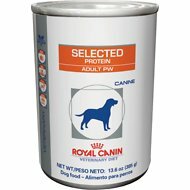 Highly palatable diet with limited ingredients for dogs with food sensitivities. Novel protein of whitefish for dogs that cannot digest common proteins. Promotes healthy skin and a shiny coat with EPA and DHA omega-3 fatty acids. Reinforces the skin barrier with essential nutrients to support dogs with skin sensitivities and irritation. Helps with constant itching, hair loss and digestive issues. 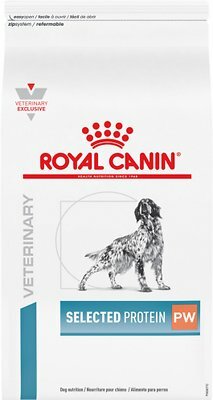 Potato, Fish Meal, Potato Protein, Chicken Fat, Natural Flavors, Powdered Cellulose, Calcium Carbonate, Monocalcium Phosphate, Fish Oil, Choline Chloride, Fructooligosaccharides, Sodium Tripolyphosphate, Vitamins [Dl-Alpha Tocopherol Acetate (Source Of Vitamin E), Niacin Supplement, D-Calcium Pantothenate, Biotin, Pyridoxine Hydrochloride (Vitamin B6), Riboflavin Supplement, Thiamine Mononitrate (Vitamin B1), Vitamin A Acetate, Folic Acid, Vitamin B12 Supplement, Menadione Sodium Bisulfite Complex, Vitamin D3 Supplement], Taurine, Dl-Methionine, Trace Minerals [Zinc Proteinate, Zinc Oxide, Ferrous Sulfate, Manganese Proteinate, Manganous Oxide, Copper Sulfate, Copper Proteinate, Calcium Iodate], Rosemary Extract, Preserved With Mixed Tocopherols And Citric Acid. Can Food Help My Itchy Dog? Scratching, biting and rubbing are signs of what is happening under your dog's coat. Skin issues in dogs can be due to food sensitivities and environmental irritants. Food sensitivities are reactions to normally harmless proteins in the diet and can occur with a dog of any age. A food sensitivity is determined by a food elimination trial which is performed under the supervision of a veterinarian. Your veterinarian may choose a diet that contains hydrolyzed proteins (ones that have already been partially broken down) or novel proteins (ones that your pet is unlikely to have been exposed to). Sensitivities to the proteins in your dog's food or environmental irritants can result in a variety of clinical signs and only your veterinarian can determine if a veterinary-exclusive diet is appropriate for your pet. 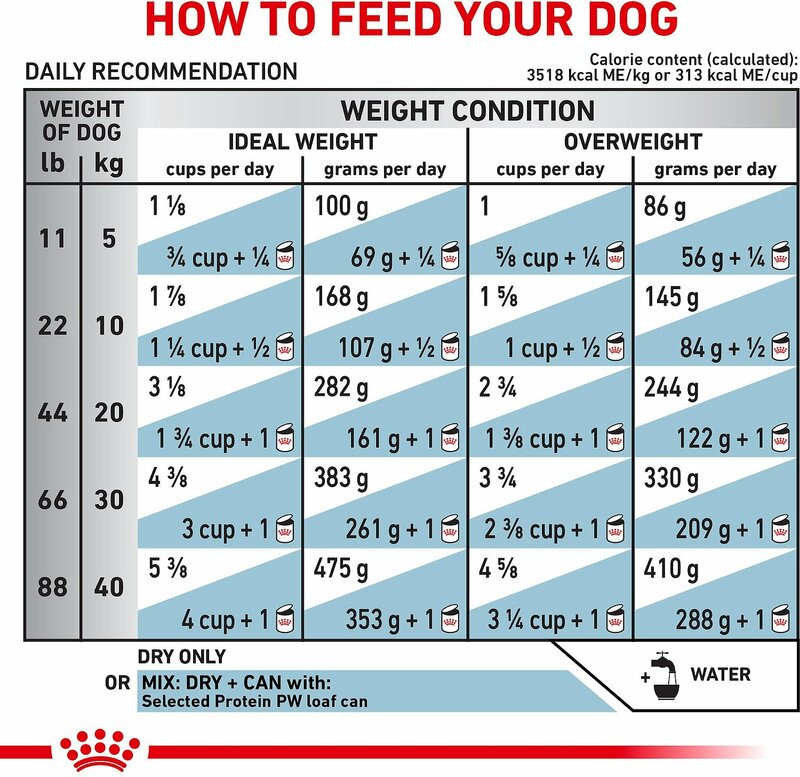 If a diet change is recommended, for best results, it is very important to feed only that food while strictly adhering to your veterinarian's feeding directions. Like you, your dog can have sensitivities to certain things in the environment such as pollens, house dust or even fleas. Your veterinarian may recommend a diet that contains optimal amounts of vitamins and nutrients which helps reinforce your dog's skin barrier. Fish and rice based diet with a patented blend of B vitamins and amino acids help maintain the skin's natural healthy barrier properties. Our boy Cash is on Royal Canin select protein due to multiple issues (IBD, chicken allergy & diabetes. We have changed from rabbit to venison to whitefish over the last 1 yr 9 mo. Currently he is on the moderate PW and doing well. I have attached a pic of kibble size since that is a common question. Thank you Chewy Team for your stellar customer service and always asking how the boys are doing. My Charlie just can’t get used to this food. I’ve tried every combination, but he won’t eat it. He manages to spit it out. Now I have a full bag of food. Will give it to the Shelter. Make sure your Dog will eat fish. Extensive GI issues - This is the only thing that works! My Yorkie has extensive gastrointestinal issues including hemorrhagic gastroenteritis, vomiting blood, etc. episodes every few months. 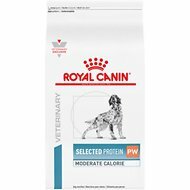 Since we switched to Royal Canin Protein PW food, he has not had a single episode. My fingers are crossed as we are nearing a year mark without an episode! One dog food my dog can tolerate! My dog has GI issues. And, this is the one and only dog food he can tolerate....and enjoy!